This manual describes the study of spatial dynamics of species composition of flowering plants in different biotopes. The main phases of the work are: planning the survey, finding flowering plants, determination of the phenological phase of florescence, listing and analyzing biotopic differences in species composition and time of florescence. It is well known that angiosperm plants growing in the temperate climatic zone do not blossom all year round but during a rather short period of time. The time and duration of plant florescence is individual and depend on many factors. The main factor that determines the beginning of plant florescence is the temperature at the plant's location. These conditions differ considerably even within the boundaries of one climatic microregion. Temperature greatly varies in biotopes – depending on the presence, density and height of the forest canopy. Trees have an influence upon the thickness of snow cover in winter, the rate of snowmelt and the warming of soil. Mesorelief works similarly. Besides external factors, biological properties and adaptations of plants also have influence upon the time and duration of plant florescence. First, time and duration of florescence depend on the life form of a plant. According to the classification of life forms proposed by Danish scientist-botanist K. Raunikier, all plants differ in the location of regeneration buds from which the plant's organs (shoots, leaves and flowers) develop. 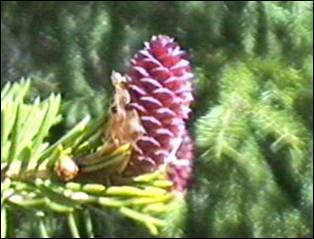 The location of regeneration buds characterizes a plant's adaptation to life during the unfavorable seasons of the year. An unfavorable season in the tropics is drought, whereas in our country it is winter. All plants are divided into five life forms depending on the location of buds against the ground or snow cover. 1. Phanerophyte (from the Greek word “phaneros” – open, evident). The buds on plants of this type winter “openly,” quite high above the ground. That is why special bud scales usually protect them. All our trees and shrubs belong to phanerophytes. 2. Geophytes (from Greek word “geos” – land). As it is seen from the name, regeneration buds of these plants are located underground. Their aboveground part completely dies off in winter. New shoots develop in the spring, from buds that are located on tubers, bulbs or rhizomes, which spend the winter under protection of the soil layer. Geophytes include many perennial herbaceous plants, such as the well-known gladiolus, tulip (bulbous geophytes) and potato (tuber geophyte). 3. Hemicryptophytes (from the Greek words “hemi” – semi- and “cryptos” – hidden). These are herbaceous plants that have regeneration buds located at the soil surface level, often under the protection of a debris layer consisting of fallen leaves and other vegetation debris. The mentioned protection is one more additional “cover” for the buds. Dandelion (its regeneration buds are located on a rosette near the ground) and yellow-cup (regeneration buds are located on creeping sprouts which are found on the ground) belong to hemicryptophytes. 4. Gamaephytes. Regeneration buds of such plants are located not higher than 20-30cm above the ground, and they spend the winter under the protection of snow cover (red whortleberries, bilberry). 5. Terophytes. These are plants that die off completely by winter and only their seed winters (they all are annual plants). Different plants blossom in different time periods depending on their life forms. The deeper the buds are hidden, the later the plants blossom and the more nutrients are stored up by the plant in autumn and the longer the florescence period lasts. The second factor that influences the time and duration of plant blossoming is the method of pollination. All plants are divided into two main groups according to this feature: wind-pollinated and insect-pollinated.